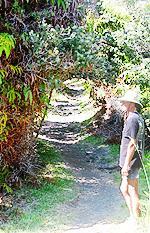 The Pu'u Huluhulu and Mauna Ulu hikes are actually two separate trails that we have combined into one hike. 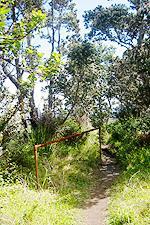 These trails are in the Hawai'i Volcanoes National Park and the Pu'u Huluhulu trail should not be confused with a similar named cone (and hike) on Saddle Road. If you only do the Pu'u Huluhulu part of this hike the round trip time is approximately two hours (2 miles round trip). If you add the Mauna Ulu hike it will take another hour (and an additional mile). 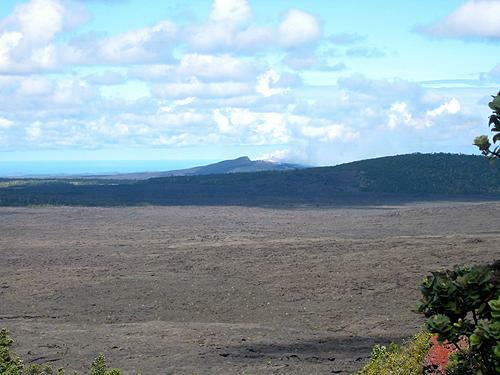 The hike takes you to the summit of the pre-historic and lush Pu'u Huluhulu cone for spectacular 360 degree views including a good vantage point for seeing the active Pu'u O'o vent. A short hike from Pu'u Huluhulu takes you to the summit of Mauna Ulu, a recent eruption site with many interesting things to see. To find Pu'u Huluhulu and Mauna Ulu take Highway 11 to Volcano and enter the Hawai'i Volcanoes National Park. Once you pass the park gatehouse make the first left onto Crater Rim Drive. Continue on Crater Rim Drive 3 miles until the intersection with Chain of Craters Road. Turn left onto Chain of Craters Road and proceed approximately 3.6 miles to the left hand turn for Mauna Ulu. This road dead-ends at the Mauna Ulu parking lot. Park and proceed to the dead end. Just before the dead end, on the left, is the trailhead with informational sign for Pu'u Huluhulu and Mauna Ulu. While this is not a difficult hike portions of the trail, especially the Mauna Ulu part, are over newer lava flows where the ground is rather fragile. 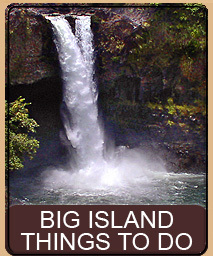 If you intend on hiking all the way to Mauna Ulu you should bring sturdy hiking boots. Because most of this hike is over lava and has relatively little shade be sure to bring a hat and sunscreen. You will also want to bring water and of course, your camera. Because this hike is mostly about the wonderful views from the top of the cones, we recommend this during as clear weather as possible. This is not a good hike to do during rain or poor visibility. Any time of day (or even night is fine if you wish to view lava erupting from the Pu'u O'o vent) though hiking in the morning or late afternoon will offer you a cooler trip. 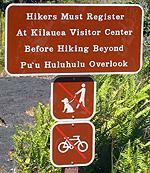 While the trail to Pu'u Huluhulu is fine for people of any age, you will not want to bring children to Mauna Ulu as it is far more dangerous. 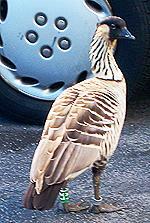 You might see the endangered Hawaiian Nēnē Goose along this trail. 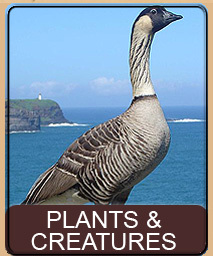 Keep in mind that these birds are protected and it is a state and federal offense to harass, touch or feed these birds. 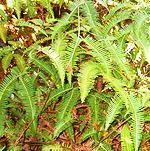 Be careful not to step on native plants along the trail, especially on the Mauna Ulu portion.. The hike to Pu'u Huluhulu and Mauna Ulu begins just a short 25 feet from where you park your car in the Mauna Ulu parking lot. Once you have parked, walk back (away from Chain of Craters Road), past the bathrooms and onto the closed portion of the road. On your left you will see a trail, along with an informational board - this is the beginning of the hike. The first quarter mile of the hike, from the informational board to the stand of trees, goes through an open lava field. The walking here is fairly level though you are walking on natural lava. In this area you will see small ferns and 'Ōhelo Berry plants, a favorite of the endangered Hawaiian Nēnē Goose that can often be found in this area. 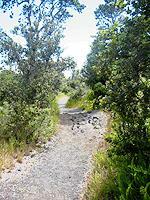 Once you reach the treeline you will enter a short, shady and pleasant walk on a gravel pathway. On your right will be a 5 to 15 foot high a'a lava field. The trees along here include 'Ōhi'a Lehua and the occasional Koa. You might also notice that the trail is marked with yellow reflective tags and often these tags have several bees grouped around the base. Apparently the bees find the glue used to attach the tags to the lava a source of sugar and just about every tag has bees gathering the sugar. Note that most bees in Hawai'i are Africanized and can be more aggressive than usual if provoked. Upon leaving the tree line area you again enter a lava field. The walking is just a bit more rough, but the path is easy to follow. As you proceed along the path you will start, after another quarter mile, to see evidence of lava trees. The lava trees in this area were formed by lava flowing from Mauna Ulu, which covered the trees. The coolness of the trees caused the lava coating them to harden slightly while the hot lava touching the tree burned it leaving a perfect mold of the original tree. As the hotter lava flowing around the tree drained away it left the cooler lava still clinging to the burning tree, which results in the shapes you will see along this trail. The further you go, the more lava trees you will encounter, and while these are not the best example of lava trees, some of the trees in this area are quite spectacular. Be sure to look closely at broken trees to see the original imprint of the bark on the inside of the lava tree. Just after the lava trees the trail will take a 90 degree bend to the right and you will see Pu'u Hululhulu on your left. 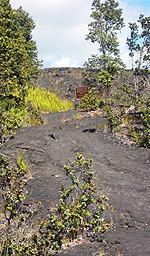 At this point the trail takes you up on newer lava and skirts the base of Pu'u Huluhulu. Be careful in this area as there are many shallow lava tubes and if you are not careful you might accidentally step in one or break through into one. Follow the trail here to ensure you stay on the well-worn path. The trail will take you around the base of Pu'u Huluhulu and around to the side. At that point the trail splits with one branch going up Pu'u Huluhulu and the other trail going on to the much further Makaopuhi Crater and Napau Crater. We will be taking the left trail, that goes up Pu'u Huluhulu. Once you begin to ascend Pu'u Huluhulu you will be in a lush forested area. The name Pu'u Huluhulu means literally Hairy Hill, which refers to the abundant growth all over the cone. There are many birds and plants in this area and the observant hiker will find many interesting things to see along this trail. 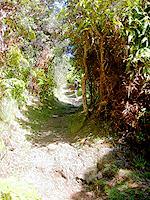 The trail itself is fairly narrow and somewhat steep but presents no problems in hiking. As you walk up the trail, you are ascending approximately 300 feet. The trail switchbacks up the cone about 11 times before you reach the top. Hikers who may be a bit out of condition might be puffing and panting up this trail, but don't turn back, the view from the top is one of the best in the park and while it may seem that the trail is endless it is really not that long. At the top of Pu'u Huluhulu is a stone stairway that ends in a cement viewing area. This is at the very top of Pu'u Huluhulu and the view from here is spectacular 360 degrees. Once you reach the top of the stairs, looking to your right and way in the distant you should see the currently active vent, Pu'u O'o smoking and belching away. If you have binoculars (or it is evening) you will also probably see the glow of lava as it leaves the vent. Extremely lucky hikers might also witness lava fountaining or spurting from the vent. 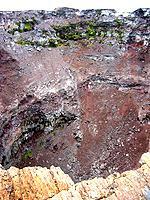 Looking downwards, at the base of Pu'u Huluhulu between you and Mauna Ulu you will see the remains of a huge lava lake. This extremely flat area of lava is surrounded on all sides by a wall of lava that stands up to 20 feet taller than the lake itself. 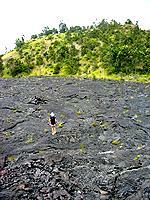 This feature is known as a perched lava pond and was formed by lava pouring out of Mauna Ulu. We will be walking into the perched pond later on this hike. Rotating your view counter clockwise, look into the very heart of the cone you are standing on. The cone itself is quite deep, much deeper than the surrounding land that was built up from Mauna Ulu flows. The entire cone, including the pit, is covered in lush forest and forms its own unique ecosystem. Look and listen for birds that live in this unique and private region. Continuing to rotate your view, on a clear day you should have a wonderful view of Mauna Kea and Mauna Loa. Below Mauna Loa you can look into the park and even see the distant Jaggar Museum and Observatory sitting above Kilauea Caldera. Continuing to rotate you will see the distant pali and on a very clear day you should be able to see South Point. A bronze marker at the top, embedded in the cement, has arrows pointing to the various place names that are visible from this vantage point. When you are ready to leave, simply descend the trail the same way you went up, back to the division in the trail at the base of Pu'u Huluhulu. At this point, if you do not wish to hike beyond Pu'u Huluhulu to Mauna Ulu, simply follow the trail back to your car the same way you came. 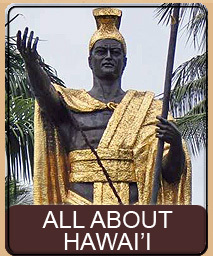 If you do not go on to Mauna Ulu your round trip will be approximately 2 miles. 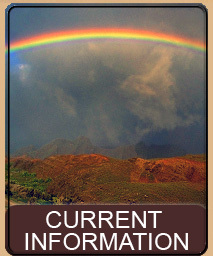 If you continue to Mauna Ulu you will add another mile and at least an hour to your time. It is not advisable to hike Mauna Ulu with children. Do not hike Mauna Ulu if you are unsure of your footing, or would have trouble jumping across fissures or climbing short embankments. 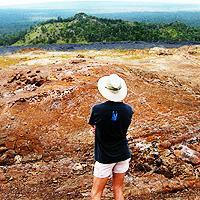 While Pu'u Huluhulu is fine to hike in shoes or rubba slipahs, you should have sturdy hiking boots to hike Mauna Ulu. Ok, so we're continuing the hike to Mauna Ulu. First, let's learn a bit of history about this cone. Mauna Ulu erupted from May of 1969 through July of 1974 and sent huge quantities of lava flowing in all directions and all the way to the ocean (6 miles), as well as covering the highway, which originally went on the other side of Mauna Ulu, past Makaopuhi Crater. On November 10, 1973 earthquakes rocked this area and a 1.5 mile long series of fissures opened between Mauna Ulu to Pauahi Crater and lava fountained from the fissures up to 200 feet in the air. However, fountains from Mauna Ulu itself reached over 1,800 feet into the air. 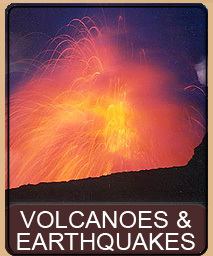 During portions of the Mauna Ulu eruption, Pu'u Huluhulu overlook was a popular place to view the spectacular events. 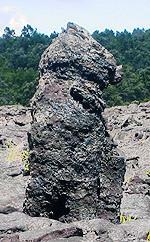 While Pu'u Huluhulu is a very old, pre-historic cone, Mauna Ulu is a very recent cone and is much more fragile. 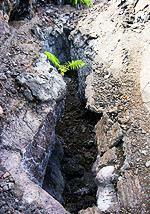 When walking up Mauna Ulu be careful not to disturb new plant life and take special care to avoid breaking through shallow lava tubes. Listen as you walk for hollow sounding areas and skirt those areas carefully. There is no real trail to the top of Mauna Ulu, though there are portions that do have some markers, you can basically pick your own trail to the top. You can not possibly get lost as Pu'u Huluhulu is pretty much always in view. The sign shown to the right is on the portion of the trail that extends past Mauna Ulu to Napau Crater. While it tells you that you need to register to go beyond you can safely ignore the sign as we are only going to the summit of Mauna Ulu, and nowhere near Napau Carter, which is a great distance beyond (and usually requires overnight camping). We personally prefer to backtrack from Pu'u Huluhulu about 25 feet to where you will find a couple rocks and a log blocking what might have been a trail. We step over the log and pretty much head straight up the side of Mauna Ulu, to the right of the perched pond. The walk up Mauna Ulu is pretty simple as it is a more gentle slope that Pu'u Huluhulu. However, the ground is extremely fragile and it is possible to break through the many shallow lava tubes that extend from the summit. Walk carefully and listen for any hollow sounding areas - which you will want to avoid. You might notice, as you are climbing Mauna Ulu, that portions of the side of the cone still have steam and smoke coming out of it. This is a good indication that there is still lava under the cone. If you climb to the summit as we have suggested, on the way up you should encounter a large channel where once a river of lava poured. This is quite an interesting feature as it is about 20 feet deep in spots and 30 feet wide with very smooth areas where the lava poured. Upon reaching the summit of Mauna Ulu the ground if full of steaming cracks and the smell of sulfur. The pit is very difficult to get close enough to, to see the bottom due to the fear of falling - however, we are going to go all the way around the cone, skirting the pit, and other areas offer a much better vantage point for seeing the bottom. So, now we are at the summit of Mauna Ulu. Let's begin to walk around the summit keeping fairly close to the pit itself (we usually stay within 20 to 50 feet of the summit as we go around). One thing you will notice is the view is wonderful. Not only can you see everything you could from Pu'u Huluhulu, as you go around you will see things that were hidden from you at Pu'u Huluhulu by Mauna Ulu itself. While Mauna Ulu is a fairly young cone, last erupting in 1974, it is beginning to see signs of life. 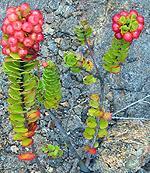 As you walk around the summit you will see small ferns, young 'Ōhi'a Lehua trees and most astonishing, large quantities of 'Ōhelo Berry plants. 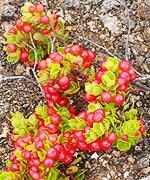 The 'Ōhelo Berry here is, for some reason, much different than that growing elsewhere. Many of the bushes are overloaded with berries and the colors vary from bush to bush from deep reds to light pinks and oranges. Additionally, some bushes show unusual growing patterns such as the one shown here with the berries growing very geometrically around the stem. Why the berries here are so colorful plant to plant we are unsure, though it might have something to do with the acidic environment the plants are growing in. As you walk, counter clockwise around the cone (we prefer the counter clockwise direction) you will notice that the ground itself is a colorful variety of different lavas. Bright reds, browns, tans and grays are everywhere and contrast nicely against the blue sky, blue-green ocean and green vegetation of Pu'u Huluhulu and surrounding areas. When you have traveled 1/4 away around you will be between the summit and the ocean. Along this area you will find huge channels in the ground - some fairly deep and wide. To cross these channels descend the cone about 25 feet to a point where you can jump across a more narrow section. The jump is not difficult, only about 3 feet. Alternately you can scramble down into the channel in this narrow area, as it is only about 5 feet deep in this spot, and then scramble up the other side. On this particular side of the cone you will actually encounter three different channels you need to cross. Each can be crossed in a similar manner to the first - by finding a shallow/narrow spot and jumping across. The final channel, shown in the picture to the right here (note John standing way at the top), is interesting enough to climb down into and then walk the floor of the channel back to the summit. There are very interesting and colorful features in this channel and the summit offers you a spot to get out of the wind and enjoy a brief snack with a great glimpse into the bottom of the cone. As you leave the channels, again stick near the top of the cone as you continue around. As you round this section you will not have a spectacular view of Makaopuhi Crater in the distance. This is a huge crater near which the old highway runs. 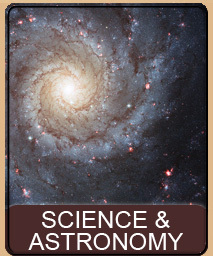 Do not, however, attempt to walk to the crater as it is much further away than it looks. 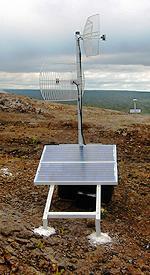 Continuing to round the summit of Mauna Ulu you will suddenly encounter scientific equipment. These are a variety of sensors that the park volcanologists have installed to monitor the movement of the ground on Mauna Ulu. All are solar powered and there are a number of devices including a seismograph, GPS sensor and a number of antennas that transmit the data as well as relay data from other sensors at Pu'u O'o. Please do not touch or in any way disturbe any of the sensors or equipment you see. Playing with the equipment could not only be dangerous to you, it could potentially threaten the lives of others who depend on the readings from these devices. Do not, however, be alarmed if helicopters appear and fly close overhead while you are on the summit. These are tour helicopters offering tourists a wonderful look into the Mauna Ulu crater itself. Usually the helicopters will circle once or twice before heading over to the active Pu'u O'o vent. Smile and wave as you are surely ending up in the photos being taken by the visitors as they gawk at the small people (you) on the summit of the cone. While you are in the area of the scientific equipment check out the pit itself. This is another good opportunity to view the bottom of the pit and will be one of the last chances you get to photograph the pit itself. Continue past the scientific equipment about another 1/4 way around the cone. At this point you will be down a bit from the summit, perhaps 25 to 30 feet. As you round the cone and start to face Pu'u Huluhulu again, we are going to descend. We don't actually completely circle Mauna Ulu - instead, we descend down just before the point we came up. Continue around Mauna Ulu until you come to another channel that obviously poured it's lava into the perched pond between Mauna Ulu and Pu'u Huluhulu. When you get to the channel, simply walk along side of it, down to the perched pond. At the end of the channel you will scramble down and into the perched pond. The perched pond is quite amazing. It is very flat and when you are standing in the middle of it you can really appreciate how it formed. The edge of the pond slopes upward up to 25 feet in places and it is this bank which kept the liquid pooled in the pond. Explore the perched pond as there are many interesting features, cracks, holes, and tubes and then when you are ready, walk straight across to the opposite end of where you entered the perched pond (this will be the end closest to Pu'u Huluhulu). Climb up the bank of the perched pond and you will really appreciate how 'perched' it truely is, as the other side descends a good 30 to 35 feet. Scramble down the bank and make your way to Pu'u Huluhulu. If you wish, you can walk right to the side of Pu'u Huluhulu where you will pick up the Napau trail that you can follow back to the entrance up Pu'u Huluhulu - and then simply retrace the trail back to the parking lot and your car. This page is named 'Hikes.mulu'. Can't Find It?